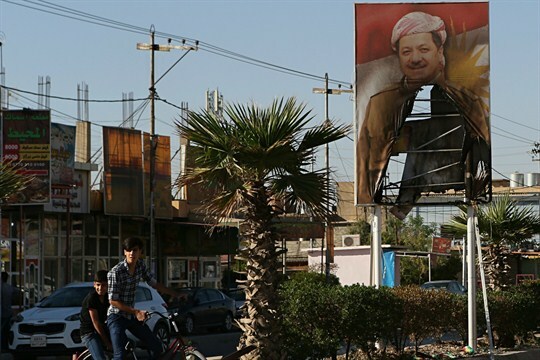 What’s Driving Iran’s Opposition to Independence for Iraqi Kurds? A burned poster of former KRG President Masoud Barzani, Kirkuk, Iraq, Oct. 19, 2017 (AP photo by Khalid Mohammed). In this week’s Trend Lines podcast, WPR’s editor-in-chief, Judah Grunstein, senior editor, Frederick Deknatel, and associate editor, Robbie Corey-Boulet, discuss the latest developments in Zimbabwe and what factors will shape political outcomes there following the military’s detention of long-time ruler Robert Mugabe. For the Report, Mohsen Milani talks with Peter Dörrie about Iran’s historical ties to Iraq’s Kurdish minority and how they are driving Tehran’s response to tensions between the Kurdistan Regional Government and Baghdad in the aftermath of a referendum on Kurdish independence. Editor’s note: In the podcast, Robert Mugabe’s age is stated as 91 years old. He is 93 years old. WPR regrets the error. What Will a Post-ISIS Political Order in Syria Actually Look Like? Is Poland Becoming the European Capital of Xenophobia?